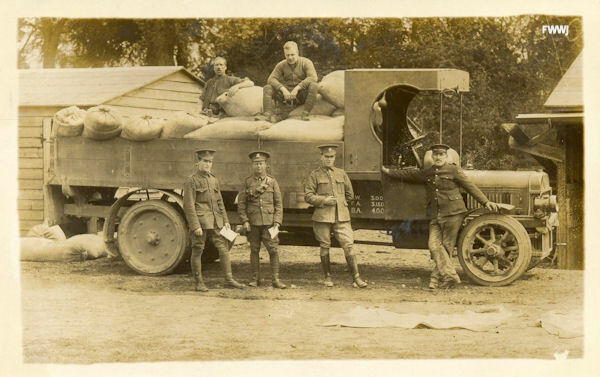 In October 1914 Cheshire Yeomanry moved to Langley Park, Loddon, not far from Norwich, and the men were mostly under canvas. In November 1914 it was reported that “Huts are being erected at Langley Park. In fact, a barracks is being built, and stabling for 500 horses. 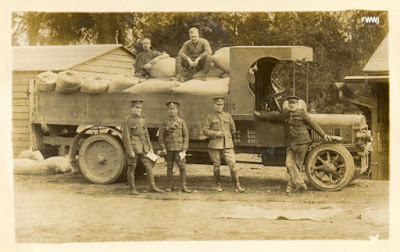 Sixty men per day are told off to assist the contractors in erecting the wooden huts, the fatigue party being under the command of Trumpeter-Major Mayers, whom Colonel H.M. Wilson has selected for this special work owing to the popular Trumpeter-Major’s knowledge of this kind of work when in civil life.” (Cheshire Observer, Saturday, 14 November 1914). Trumpet-Major B. Mayers had long service with the Cheshire Yeomanry. In the Regimental history it is noted that during the annual exercises at Chester in 1898, reveille was sounded each morning by the Regimental trumpeters outside the main billets. It was Trumpeter B. Mayers that performed outside the Grosvenor Hotel where the officers were billeted. No record of overseas service during the First World War has been found for B. Mayers. Colonel H.M. Wilson was the commanding officer. Progress on the erection of the huts was summarised on the following uncredited article from December 1914. Langley Park, near Norwich, Dec. 7th. One squadron (A) of the Cheshire Yeomanry are now housed in huts at Langley Park, while it is expected that B squadron, on their arrival back from Yarmouth on Tuesday next, will proceed to the huts also, and take up their residence in the wooden barracks. The remainder of the regiment, C squadron, are living in barns, etc. in the vicinity of the park, until the huts are completed. It is expected that the whole the regiment will be in residence in the huts in about a fortnight, and then the regiment can enjoy the Christmas festivities, and meet again after about six weeks’ separation. Several of our old pals from Chester we have not seen for weeks, it will be a grand reunion when we meet together again, practically under roof. Trumpet-Major Mayers, who has the construction of the huts in hand, explains that our quarters, when finished, will consist 17 stables, each 30 yards long by 10 feet wide, fitted up with zinc mangers and open at one side, the open side being covered with tarpaulin sheets at nights to protect the horses from the weather. Each troop will have its own stable. The men will housed one troop in a hut, 90 feet long 20 feet wide, and 18 feet high, heated by two stoves and lighted two 100 candle power naphtha lamps. The beds consist of three 10 inch planks, 6 feet 6 inches long, on a trestle raised 9 inches off the ground, each man providing his own "spring mattress," which consists of a case filled with either straw or wheat chaff. The men’s huts are made to look very comfortable. One half is given up to sleeping accommodation, while the other half is used as a dining room, etc., fitted up with tables and forms, and also 10 deck chairs per hut. There are also food cupboards, shelving and rifle racks, which make it very convenient for the men to keep their kit, arms and equipment. Every man in turn is told off daily to clean out the hut and keep the place tidy, and once every week the floors are scrubbed. The man told off for this fatigue duty is called “Mary Ann,” but as each man takes a turn at domestic work, there are a number “Mary Ann’s.” There is also a recreation room, 150 feet long by 28 feet wide, and a bath house, containing 60 wash basins and 10 baths, fitted up with hot and cold water. There is also a drying room, where men can dry their clothes, and this will be much appreciated by us all. We have also a cook house, 60 feet long by 30 feet wide, fitted up with two Army cooking ranges with cooking capacity for 1,000 men. One and a half miles of piping has been laid to bring water from a well at Langley Hall. In addition to other conveniences we have a miniature railway, 2 1/2 feet gauge, used for the conveyance of supplies to the various portions of our wooden barracks. The huts are situated in a beautiful portion of the park adjoining a charming country road. Great credit must be given to Trumpet-Major Mayers, who has watched and supervised the contractor, and has been responsible to Col. H.M. Wilson for the huts being erected so as to give as much comfort to both men and horses as possible. We are going to have a weekly dance in the recreation tent and also concerts. The dance and concerts are attended by our officers, and the villagers are also invited, and many of them drive several miles to be present. The N.C.O.’s are tonight (Monday), having a dance at the Town Hall, Loddon, Col. Wilson and officers paying all the expenses. A few of us will be allowed to come home for three days at Christmas, but those who cannot get away are promised by Col. Wilson, Major Barbour, Lieut.-Col. Brocklehurst, Major Glazebrook, Major Tomkinson, Lieut. Neilson and our other officers a good old Cheshire Christmas in Norfolk. The Regiment remained at Langley Park until 26 July 1915. At this time, they moved to Somerleyton Park and took over a new sector of coast at Lowestoft, about four miles from camp. The following postcards feature Lance-Corporal Thomas Minshall of “C” Squadron, Cheshire Yeomanry. He was appointed Lance-Corporal on 17 February 1915, and the cards, which include wooden huts, likely date from the period that the Regiment was based at Langely Park. 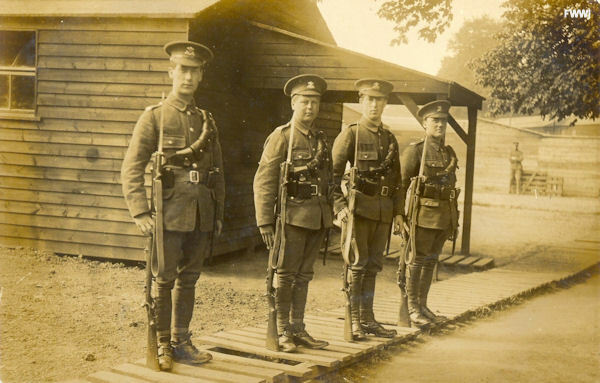 Lance-Corporal Thomas Minshall, Cheshire Yeomanry, second from the left. Lance-Corporal Thomas Minshall, Cheshire Yeomanry, standing second from the left.